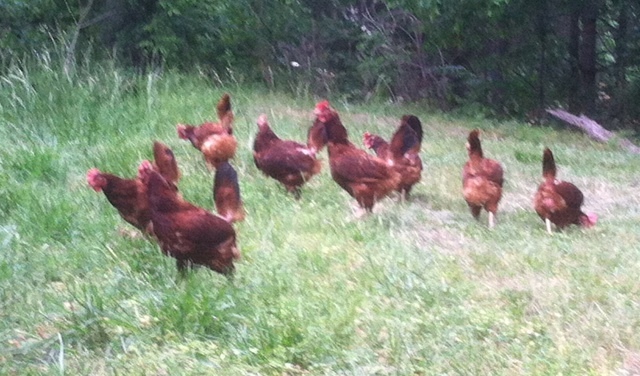 Last night was the first night we let the gals out of their coop. We’ve tried to keep them happy with a variety of treats and snacks, but we could tell they were getting board and restless. They were feeling, pardon the pun, cooped up. We’ve been afraid to let them out because we have dogs – bird dogs. But finally we decided we (and they) couldn’t stand it any longer. We penned the dogs (oh, how they howled) and let the gals run free. To add to the festive mood, we fixed a batch of margaritas and spent the evening watching them peck around delighting in the delicacies of fresh bugs and green grass. Who says Saturday night in a small town isn’t exciting? We plan to make Girls’s Night Out a habit – margaritas included, but our poor dogs aren’t going to like it. Anyone have any tips helping dogs and chickens get along? Awesome! You definitely should make Girls’ Night Out a habit! As for tips… mmm, I don’t keep any pets at present… but you could try putting them side by side (cage to cage) for a while from time to time to get them used to each other??? Not sure if that would be considered a good idea or not amongst animal lovers?! I’m not sure side-by-side cages are the answer either. I will have to post the picture of the dogs outside the chicken coop gazing in with frozen stares. They are definitely obsessed with the gals. Oh well even the simple life on the farm can’t be all peace and harmony.